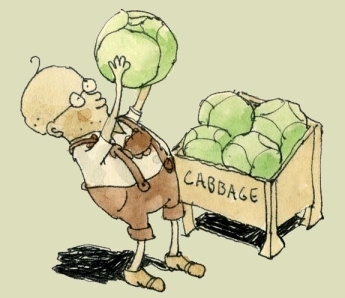 The first part is finding the perfect cabbage, not to worry you will know when you’ll see the perfect cabbage. Just remember: choose with your heart. Now it’s time for trying to woe the cabbage, this is not that hard, cabbages falls in love easily. Mattias Adolfsson. Illustrator aus Schweden. Tusche und Aquarell. Und v.a. mit dem richtigen Zugang zum perfekten Sauerkraut.